What do ABBA, Cliff Richard, Celine Dion, Katrina and the Waves, Gina G., and t.A.T.u all have in common? Each one owes a debt of gratitude to those who voted them winners of the euro trash contest that helped further (or launch) their career, EUROVISION! That’s right people, it’s that time of year again and I couldn’t resist writing about it. Every year since 1955 Europe broadcasts to hundreds of millions around the globe a combination of kitsch pop, questionable fashion and the worlds worst television hosting. Some of the acts are… well… just plain embarrassing. Yet it is still one of the most watched and influential music contests in the world. Interesting fashion… I obviously use the word ‘fashion’ loosely. Eurovision usually resembles a fancy dress party with a hybrid eighties/futurama/horror/formal-wear theme. 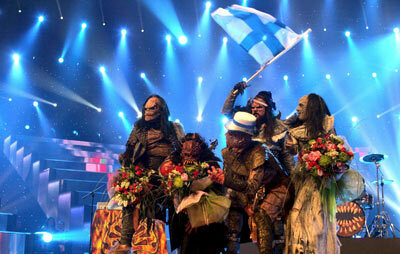 If you think I’m joking, just think back to 2006 and Finland’s Lordi performing Rock Hallelujah dressed as creatures from another world. Next we all enjoy the entry featuring a goat herder of sorts playing a wind instrument we have never seen or heard of before. Generally speaking I think world-music is sensational, but, where on earth do they find these people? Oh wait, that’s right… they find them in Europe. Then of course there are the hosts. The formula is simple – pick two very attractive people, tell them to speak english (even though it is clearly their second language), read the tele-prompter, show your teeth, and get more crowd cheers than your co-host. Every year they look and sound more awkward reminding me of Victor and Sveta of Fast Forward fame rather than the celebrity clad models they apparently are. 1. It’s so very bad. Western culture is bombarded with ‘perfection’. We are frequently exposed to slick presentations, perfectly edited commercial quality viewing that is full of attractive people looking and dressing like we probably never will, selling us products promising we will look like them if we make a purchase, and we generally don’t feel very good about ourselves as a result. Enter something like Eurovision… some of the performers are not what we would expect, the hosts frequently fumble through, some of the outfits look a little on the odd side, some of the performers don’t quite nail it… It is any wonder people enjoy watching this! It is easy to feel good about oneself when watching Eurovision. One can be less than perfect and still be liked – popular even! 2. Another reason people like Eurovision is because it is a little bit hipster. Take European art, bizarre fashion, and performers not known in the mainstream, and you have a new fad waiting to occur. Of course the minute we all cotton on to this brilliant new-thing it becomes ‘so last minute’. 3. Finally, the power of ‘shared experience’ (on peptides in the case of Eurovision) leaves people feeling connected to a bigger story. It matters not what the context and content of the gathering is, if people come together around a common focus they feel connected to others and part of something bigger than themselves, which is incredibly important for one’s sense of belonging. Seems we are a lonely bunch and something as simple (and strange) as Eurovision can bring people together in ways they otherwise would not. And I agree with her! So get with your friends, dress like a goat herder, and watch it on SBS this weekend. To put you in the mood check out Ireland’s 2008 entry below, three cheers for Dustin the Turkey! This entry was posted in culture, Entertainment, Music and tagged Culture, Entertainment, Eurovision, Eurovision 2013, SBS. Bookmark the permalink.